The term "window treatments" refers to any way you might cover your windows (be that with shutters, drapes, blinds, or the like), most of which are far more than merely decorative. Drapery and shades provide much needed privacy, insulation from the outside elements (helping to conserve energy), and protect items within your house from sun discoloration. The best window treatments are effective at these tasks but also very pretty! There are lot of options out there, so here are a few of my favorite ways—whether you prefer drapery or shades—to treat yo windows. Consider the questions below before making any decisions, so that bad drapery doesn't happen to you. What's your desired level of privacy? This will help you narrow down fabric options, which range from from sheer linens to solid cottons. If you want even more privacy and light blockage than a fabric allows, you can also choose to get your window treatments lined at an additional charge. Which pleat style is best? The pleat style you choose (that's the pinching effect where the drapes meet the rod they're secured to) will play a huge part in the look created. No pleat is right or wrong; it’s more about dressy vs. casual rather than modern vs. traditional. If you’re a jeans and t-shirt kind of gal or guy, a "two-finger pleat," might be more your speed than "a goblet," which has much more volume to it. 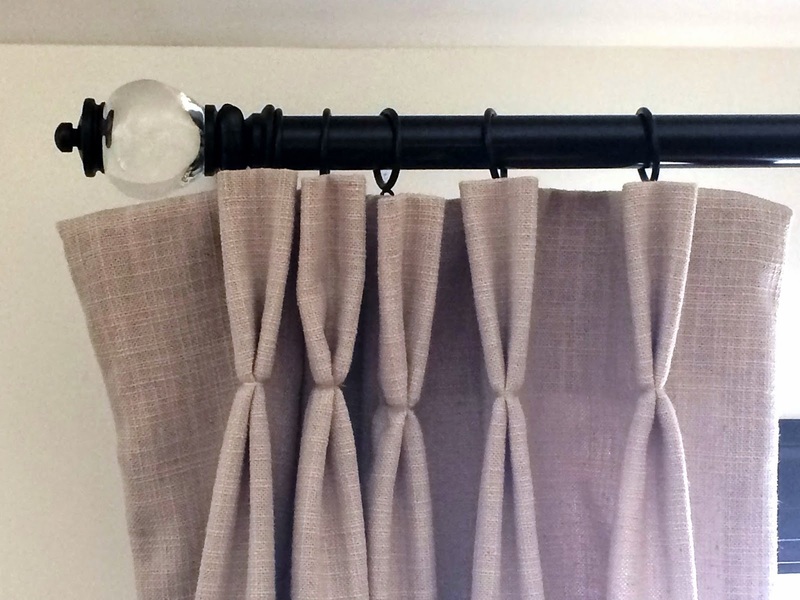 And as you'll see once you start curtain shopping (yes, you're going to go curtain shopping), there are a number of other pleating options depending on the look you want to achieve—some more ornamental and others of the subtler variety. How high or low should they go? Good proportions are key in creating drapes that look thoughtfully planned even if they aren't custom-made. The safest and most popular length for drapes is to have them just grazing the floor, whereas installing them so that two or three inches of the fabric pools on the floor will provide a dramatic, ethereal look (this look works especially well with sheers). It is never recommended, however, to have your drapes hang higher than floor level, which will read as a mistake. Culottes may be back in for spring, but trust me, the look doesn’t translate to interiors. Hanging draperies close to the ceiling makes the room appear grander and the ceilings appear taller, as in the image above. You don’t want to go crazy, though—if the window treatment gets too far above the window frame it will look awkward. In the same way that hanging drapes higher than the window frame will make the room appear taller, installing drapes wider than the window frame can help a small window look grander. Drape width should be approximately double the width of the window they are covering for balanced fullness. Shades, which are more structured than drapery, can get you through a number of tricky design situations. They work well on windows that sit up high off the floor, are particularly narrow, or are divided into multiple segments—and they can work to diffuse or block out light completely depending on how sheer they are. Before springing for a style, however, you must answer the question of whether you want inside or outside mount shades—meaning inside or outside the window frame. Inside mount can look cleaner and allows in less light, but sometimes the depth of the window frame will not allow for it. If this is the case, outside mount is a great option. You can even mount shades up near the ceiling to create a high ceiling effect, as with drapes. Cellular shades, also called "honeycomb shades" due to the way their pleats look from the side, provide excellent insulation, keeping hot out in the summer and cold out in the winter; they've been called the “workhorse” of window treatments. Many come with a top-down/bottom-up feature, providing optimum light control, but perhaps their best feature is a cordless operation that gives them a clean, minimalist look. All this on top of the fact that the cellular shade is a very affordable option means they're worth giving a shot if you want something unfussy for your windows. Roller shades are great for rooms with a view, because with the right level of opacity you'll be able to see through the shade material while still diffusing harsh sunlight. Are you more of a drapes or shades kind of person? Tell us in the comments! ??? Decor on a food site? OK, we'll go with the flow. I went to a dinner at one of these places that is very zen and spare, what the French call épuré. It was NOISY. No soft surfaces. No curtains. No carpets. No cushions on chairs. With two people it was loud; when all 20 gathered around the table, I couldn't hear a thing. Curtains serve several purposes: light, privacy and noise. Also re shutters: in France they are operational. We shut the shutters at night in winter to keep the heat in. We shut them at night/before dawn to keep the sun out (no A/C). It works. Very environmentally friendly.